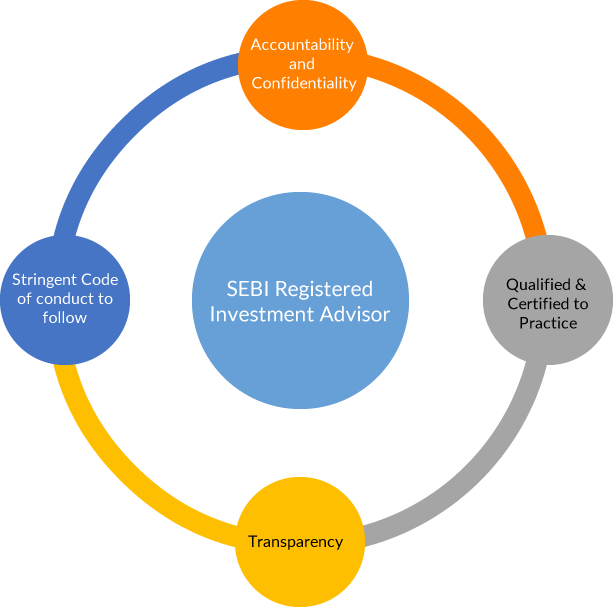 How does dealing with a SEBI Registered Investment Advisor benefit you as a client? Your RIA is qualified and experienced to practice, with mandatory certification and at least five years of experience in financial advisory or post graduate in finance, economics, etc. Your RIA follows stringent rules and code of conduct framed by SEBI, at par with global practice standards. Your RIA maintains proper records of all client engagements in physical/electronic form for a minimum of five years to ensure accountability. Your RIA also ensures that your personal financial data remains confidential and is not misused. Your RIA discloses to you all material information including the terms and conditions of advisory services offered, engagement with other intermediaries, conflict of interest, if any, etc for transparency.